If you’re looking for a good entry level mountain bike that won’t break the budget and offers riding on a full suspension frame, then you can’t do much better than the Diamondback 2014 Recoil 29 full suspension mountain bike. 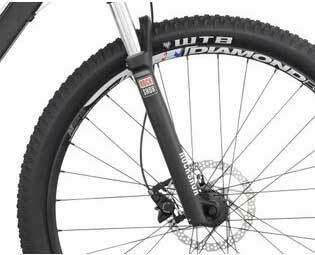 As you may already know, Diamondback is a well known and trusted brand when it comes to mtbs and this Recoil 29 model for 2014 shows why they have such a great reputation. A full suspension bike like this one is great for both those who are beginners to mountain biking as well as those who are interested in riding on trails that are a bit more aggressive. If you’re not sure if a full suspension mtb is for you, read our guide on hardtails vs full suspension mountain bikes for some clarification. But if you’re interested in learning more about this great bike from Diamondback, then keep reading for our full review. The 29 inch wheel platform is super popular for mountain bikers, which is one of the reasons that this model from Diamondback is used to widely by mtbers. And it doesn’t hurt that you get to do your full suspension riding on a good, cheap entry level mountain bike that is affordable and fun to ride. This is a good starter mountain bike for a lot of reasons, but first let’s touch on why the 29-inch wheels are so great for mountain biking. When you are mountain biking, you want to be on a bike that can easily make it over rough terrain without chucking you off the bike. Well, the 29 inch wheel platform is a like a steam roller and that rough terrain is no match for it. The end result is a surprisingly smooth ride, great traction and awesome speed. If you’re an experienced mountain biker who is new to full suspension mtbs, then you might be surprised at how well the Recoil 29 travels over rocks and tree roots. The four inches of suspension travel are very effective as absorbing all those bumps in the trail, leaving you in complete control the whole time. This mtb is not short on features. You get things like 32h Diamondback SL-7 double wall rims and Shimano Acera rear derailleur w/SLM-310 8spd Rapid-fire shifters. Of course, such things are likely pointless to someone who is a novice when it comes to mountain biking, but know that this bike is packed with some great specs. Plus, the 8-speed drivetrain gives you options for climbing and descending, which is nice. Probably the worst thing about this bike is that it is kind of heavy. Sure, there are lighter options available but they seem to have a much higher price tag. And though Amazon only offers it with a white frame, you can find it available in a cool red at some other retailers. Honestly, I prefer the red, so definitely look for it before you buy and see if you do as well. To get an idea of the type of ride this thing can handle, check out the video below. But do note that this video is for the 2013 model of the Recoil 29. 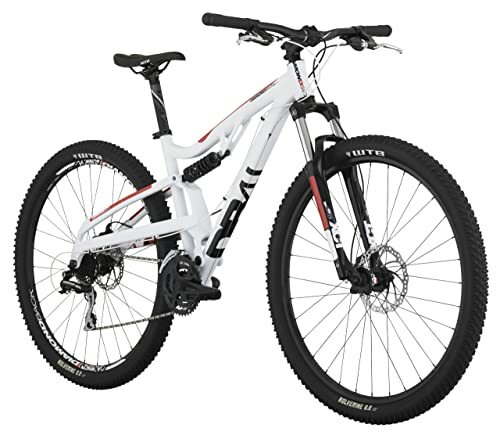 The bottom line is that this is a decent quality and affordable mountain bike for beginners as well as moderately experienced mountain bikers. However, I think is it is best for beginners who are on a budget as there are certainly better options out there with a higher price. 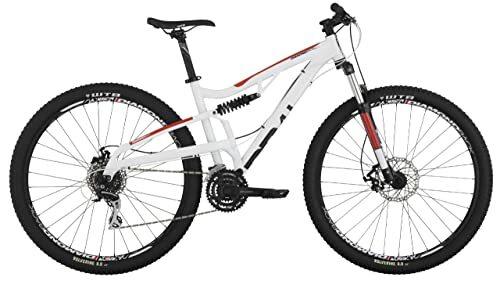 If you are interested in getting into some aggressive mountain biking but don’t want to spend thousands of dollars on the top of line models, then this is an excellent choice. But, if you have some experience mountain biking, then you’ll probably find that this bike isn’t designed for the type of riding that you want to do. That being said, you can easily get thousands of miles out of this bike, which makes it a good value for the money. Want to read some more reviews from unbiased owners of this bike? Just scroll up and click on the Amazon link above where you can read what other mountain bikers have to say about it. Good eye, that vid was shot in the Vegas area! Have fun with your new 29er – I think you’ll really love it.